you asked. i answered. or tried to. May 28, 2009 by Meg Fee in who am i? What would you like to know? I asked. And Ask you did. If I answered all the questions at once I fear you would become terribly overwhelmed and then terribly bored. So here are a few. To start. Who am I? Answered through your questions. In light of your recent Disney related post, which of the heroines of animated yore was your favorite. And which hero (prince) did you have a crush on (because no gal grew up on Disney without a crush on at least one of them)? Well, Belle of Beauty and the Best fame, for sure. Adventurous, daring, an independent thinker, and a lover of books--yes, please, me too. 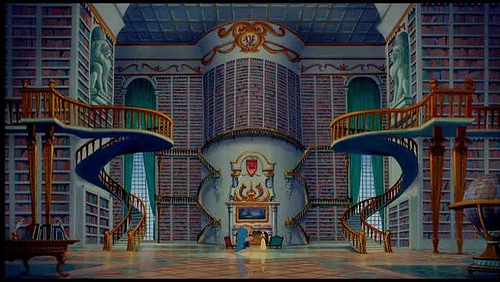 And my goodness, have you seen her library? As for my crush...Prince Eric...his dark hair made me swoon. What is something people are surprised to find out about you? I had my first kiss the day before I graduated from high school. I once went on something of a date with one the most famous American playwrights of all time. Most nights I fall asleep listening to an old episode of Frasier. I honestly don't know if I can answer this one. I don't know what my favorite part is and I'm afraid if I probe too deeply, well then I might just ruin it. But perhaps, it's the challenge as well as the freedom. In performance anything is possible. So many dream jobs. To work on stage in New York with actors I admire and respect. To travel all around the world making film after film. To write a book. Or a screenplay. To write for a magazine. To coach politicians on how to deliver a speech. To be a wife, a mother. Oh brother, not sure if there is a particular genre. I love a lot of different things. But dance music and ultra-poppy stuff of today is not my cup of tea. I tend to love female songwriters: Missy Higgins, Ingrid Michaelson. And anything that would fit into the movie Almost Famous. I love Badly Drawn Boy. The Beatles (who doesn't). Beirut, oh let me count the ways I love Beirut. Billy Joel. Blue October's first album. Bruce Springsteen's album, The Rising, following September 11th. Some stuff by The Decemberists. The Dixie Chicks' album Taking the Long Way. Edith Piaf (my God, she could sing). Some of Eric Clapton's classics. Garth Brooks (yup, I got some Texas in me).Gipsy Kings. John Legend. John Mayer's No Such Thing album. Marc Cohn. Zoe Keating (she plays the cello and it's unbelievably beautiful--look it up). some things by K'naaan. Simon and Garfunkel. Cat Stevens. Elton John.....the list could go on and on. What do you do when your down and just in need of a good cry? Drink a glass of wine. Soak in the tub. And pray. Pray for its arrival. Do you have a favorite poem or little saying? Lord knows I live off of quotes. They feed me. Nourish me, deeply. How can I choose a favorite? I can't. Instead I'll just post as many as I can. For as long as my little fingers can type. Though, this one that I posted recently--the language always catches me off guard--it's not what I expect or remember when I think of the quote--it's better. And this too. As for poetry. Jeffrey McDaniel is my absolute favorite poet. I love "When a man hasn't been kissed," "The Secret," "The Archipelago of Kisses," and "What Year was Heaven Desegregated" to name a few. What's the one thing that really, absolutely drives you bonkers? If you were to just drop your bags and escape to one place on this earth, where would it be? The Dalmatian Coast. Off of Croatia. Go ahead, watch Casino Royale again (the first of the Daniel Craig Bond films)--it you don't fall in love with some of those landscapes than we just cannot be friends. Which do you like best? cookies or cupcakes? What do you do when you're typically upset about something? I'd like to say I don't stew. But I do, I'm sure I do. And I imagine those around me, who know me very well, know that I'm upset even before I do. But...a good book, a good bath, a good clean of the room...well, those things just make it easier to get out of bed in the morning. And a good cry. A good cry above all else. The gentle, rolling release. Unfortunately, my good cry often comes at the most inopportune times, but I'll take ‘em when and wherever I can.